A massage is one of the most luxurious experiences a person can have. It’s also a very healthy experience, as a massage given by an experienced massage therapist soothes the muscles and helps release toxins from the body. All of this is extremely healthy, and it goes a long way towards making the massage client feel relaxed and energized. Given all of this, it’s no wonder that today the massage industry is more popular than ever. A massage is a treatment that brings a therapist in close contact with their clients, which is why its important to have every aspect of the massage area in excellent working order. The area should be spotless and have a clean, pleasant smell. Many therapists like to have a massage table as part of their professional package. A good massage table should be sturdy and sized to fit a variety of body types safely so they can relax during the treatment while the massage therapist works on their muscles. 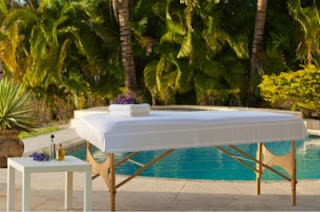 Another important aspect of the massage package is a massage table fitted sheet. A clean, breathable fitted sheet is very important for the massage table, as it keeps the client comfortable while also keeping them from slipping during the treatment. A good fitted sheet should fit the massage table exactly so it stays on firmly and again, keeps the client comfortable during their treatment. A fitted sheet sized to the table is a major asset for treatment, as it can be washed daily so there’s no buildup of oils or residue from the client. A clean white sheet in 100% cotton is recommended, as cotton is very breathable as well as durable. This type of fitted sheet will last for a long time, though many washes, so it’s a great investment in a massage therapist’s business. There are many quality fitted sheets available in sizes that will easily fit a massage table, so don't miss out on this valuable asset for your massage business.